This NIS vaccine compliance program is revealed in a letter being sent to U.S. households by Edward J. Sondik, PhD, the director of the National Center for Health Statistics at the CDC. The CDC, you may recall, was instrumental in pushing the false swine flu pandemic scare and encouraging governments to order billions of dollars worth of vaccines from drug companies. Following this marketing fraud, the former head of the CDC, Dr. Julie Gerberding, went on to accept the lucrative job as the president of Merck’s global vaccine division (http://www.naturalnews.com/027789_D…). One of the CDC’s top researchers who worked under Gerberding, Dr. Poul Thorsen, was later indicted by a federal grand jury for allegedly stealing grant money and using it to buy luxury cars and motorcycles (http://www.naturalnews.com/032216_T…). Now the CDC is bullying parents across the USA to comply with child immunization surveillance programs by calling their home phones and asking them to produce child immunization records. 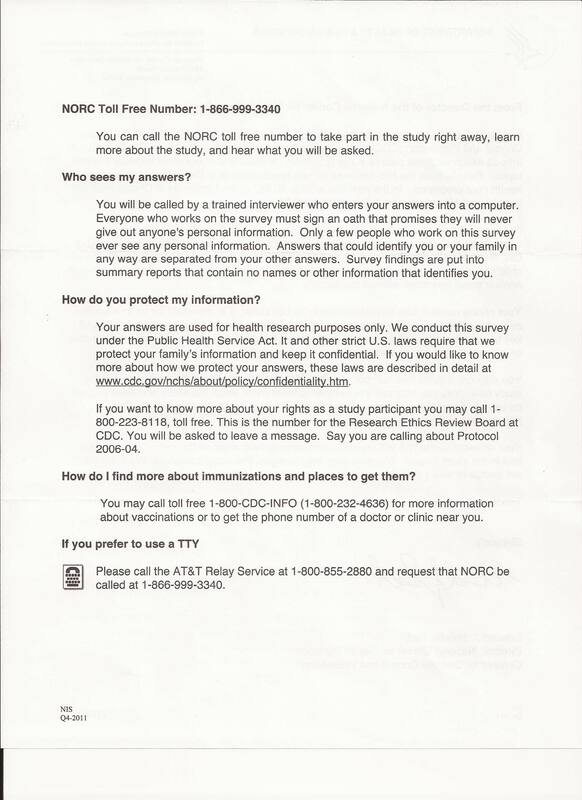 “Your phone number was chosen randomly by computer,” explains the letter, which goes on to say that the CDC will use your information to generate a map of vaccine compliance — no doubt to later target low-compliance areas with increased vaccination propaganda or even court-ordered immunization mandates like the one we witnessed in Maryland (http://www.naturalnews.com/022242_m…). 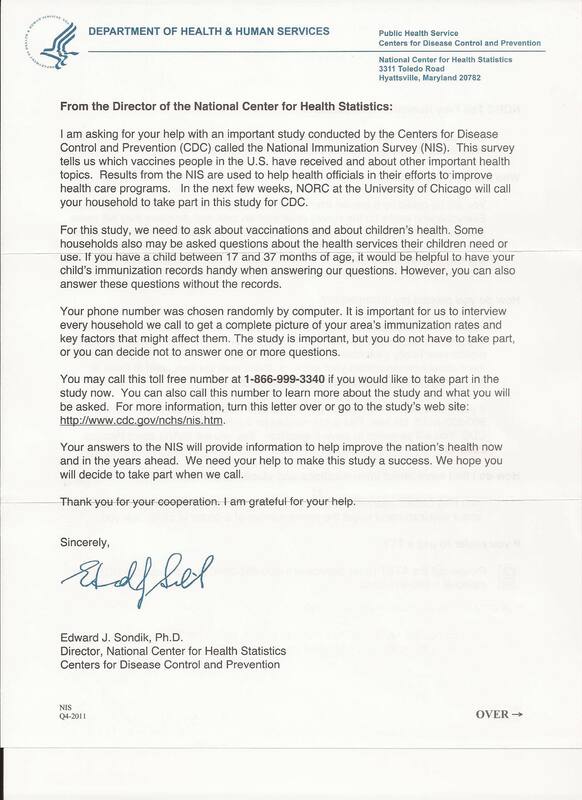 “It is important for us to interview every household we call to get a complete picture of your area’s immunization rates,” the CDC letter explains. “Your answers to the NIS will provide information to help improve the nation’s health now and in the years ahead,” it continues. Which means, of course, that this information will be used to push more vaccines onto more infants by targeting areas with low vaccine compliance rates, such as African American neighborhoods which are rightly skeptical of government’s claims about vaccines. “Respondents are asked a series of questions about the vaccinations received by selected children (including recommended seasonal flu vaccines),” says NORC. And after that, NORC will request permission to acquire your child’s immunization records from your doctor! 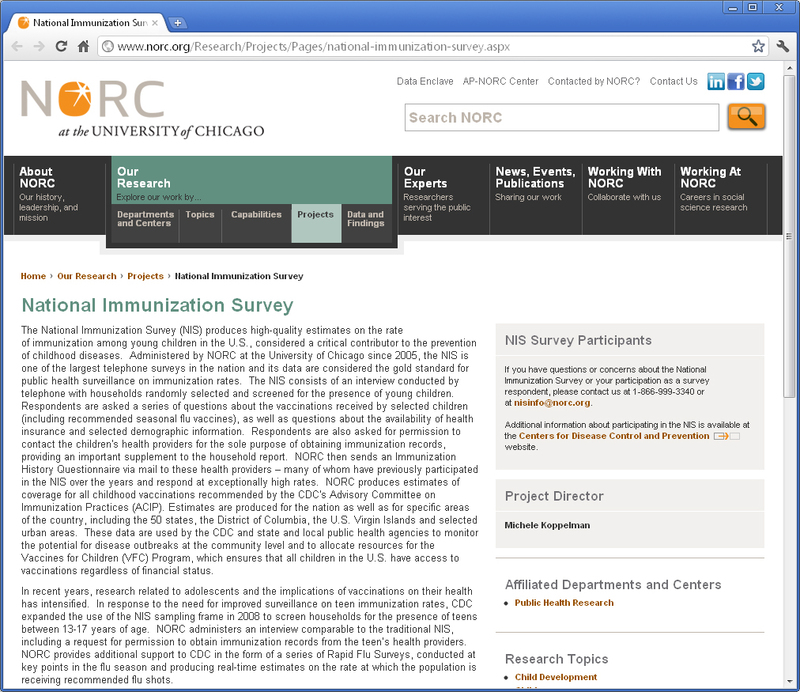 “Respondents are also asked for permission to contact the children’s health providers for the sole purpose of obtaining immunization records, providing an important supplement to the household report,” NORC explains. Yes, once you answer the interrogation questions on the phone, they will then go straight to your doctor to acquire vaccine records there in order to determine whether you were lying on the phone. The original source of this is: http://www.norc.org/Research/Projec… (but they will no doubt change their page after this NaturalNews story goes live, which is why we posted a screen shot). And now, thanks to the police state tactics being increasingly used by the federal government to enforce vaccines even at gunpoint (as we saw in Maryland), it appears we are about to enter a phase where it’s not just TSA reaching down your pants, but CDC running vaccine surveillance and compliance tracking in order to make sure no one goes unvaccinated in America. Flu vaccines also cause seizures (http://www.naturalnews.com/029334_f…), vomiting, fevers and other dangerous or even deadly side effects (http://www.naturalnews.com/029586_A...). Cell phones? Ambitious research programs? This only begins to make sense when you realize that the CDC awarded $5 billion grant money to computer surveillance and weapons contractors to develop aggressive public health (vaccine compliance) surveillance programs (http://www.irconnect.com/noc/press/...). Northrup Grumman is a weapons manufacturer that has been caught by the U.S. State Department selling technology secrets to the Russians and violating international arms trafficking laws by selling computer guidance systems to Israel and China, among other countries (http://en.wikipedia.org/wiki/Northr…). This is all being conducted like a military operation, not a compassionate public health initiative that genuinely seeks to save the lives of children. If the CDC really wanted to save lives, it would aggressively promote vitamin D, which can prevent nearly all winter flu cases, cancer cases (http://www.naturalnews.com/021892.html) and even kidney disease or osteoporosis. But instead of recommending affordable solutions that really work, the CDC focuses its billions of dollars in taxpayer money on tracking household compliance with deadly vaccines. This is public health? Get real. Non-compliant households to be added to quarantine list? What the CDC is also probably not telling you is that people who answer the survey and admit they have not given their children vaccines could in theory be added to a quarantine list to be arrested and thrown into FEMA camps during the next pandemic outbreak. The recent “terror exercise” in Denver, called Operation Mountain Guardian featured government SWAT teams and armed military-style squads entering public schools and terrorizing children with simulated gunfire and explosions, then conducting secret mass-arrest exercises in a large sports stadium. As Alex Jones explains on InfoWars.com, this is all practice for kidnapping children, taking them to stadiums, then calling parents to come pick them up at which point the parents are then arrested and taken away by law enforcement authorities (http://www.infowars.com/denver-terr…) while the children are turned over to the state. The children are essentially used as “bait” to arrest parents who happen to be on whatever government “lists” are considered offensive. If your name is on a list provided by the CDC, claiming that you are a “bad parent” because you refuse to vaccinate your children, you could have those children taken away by the state — at gunpoint! This is similar to what happened recently with Maryanne Godboldo in Detroit, who was subjected to a 12-hour SWAT team standoff because she refused to medicate her teenage daughter with dangerous psychiatric drugs (http://www.naturalnews.com/032091_M...). Of course, the CDC claims your privacy will be protected in all this (yeah, right). “Strict U.S. laws require that we protect your family’s information and keep it confidential,” the CDC’s letter says. Importantly, however, there is nothing in the CDC’s letter that says it will not violate those laws. So it’s really just clever lawyer-speak to say that “laws require we protect your information” without saying the CDC will abide by those laws. After all, there are strict U.S. laws that prevent the ATF from running guns into Mexico, but it violated those laws anyway (http://www.naturalnews.com/032934_A…). There are strict U.S. laws that require the President to seek Congressional approval for acts of war, but those laws have been violated routinely for decades. There are strict U.S. laws that protect the due process of U.S. citizens, and yet the U.S. is steeped in illegal secret prisons and torture initiatives that were rolled out under Bush and yet have actually been expanded under the Obama administration. In fact, if there’s anything we’ve all learned about watching the federal government over the last decade, it’s that the government will openly and brazenly violate whatever laws it wants in order to get what it wants. This is especially true in health care, where the FDA, for its part, openly engaged in illegal international abductions of American citizens (http://www.naturalnews.com/033573_F…) in order to oppress herbal cancer cures that really work. And the CDC, we all know, wants increased “vaccine compliance” so that vaccine makers earn more profits from selling these deadly injections to parents who have no idea those vaccines are making their children autistic (or even killing them). The message is quite clear in all this: We’re from the government, we’re going to be calling your private home phone number and asking you questions about your child’s immunization history. We want you to produce your child’s vaccination records. We will also acquire your doctor’s vaccine records to find out if you are lying. The information will be used to track vaccine compliance in your area. And if you want to get “compliant,” here’s a government phone number to call which will direct you to the nearest vaccine center. The vaccine industry, remember, is running a kind of modern-day McCarthyism, where being intelligently opposed to vaccines is a lot like being accused of being a “Communist” back in the McCarthy era. The government is now admittedly using weapons technology companies, phone surveillance techniques, immunization tracking and statistical analysis to find out who is not being vaccinated. These are police state tactics now being used by the vaccine industry — in collusion with dangerous government mandates and rogue CPS agents — to attack your freedom of choice and your right to make parental decisions about the health of your child. What we are all suffering under today, friends, is a vaccine-pushing police state and its accompanying Ministry of Truth (the CDC and FDA). This is not about public health, it’s about injecting infants and maximizing the profits of the vaccine manufacturers, even if countless children and teens are permanently harmed as a result.